Chicago Addick living in Bermuda: "We're proud of you, Charlton"
"We're proud of you, Charlton"
You may have seen this as a thread on Charlton Life yesterday but to jog the memory today is the 22nd anniversery of Charlton's final game at The Valley before being carted off to Selhurst Park, like a dying man to a hospice. The piece below is quoted from Rick Everitt's fantastic book Battle for the Valley. It's a truly inspiring story. "In the days leading up to the game, fans broke into the ground overnight and daubed slogans on the terraces and buildings, attacking both Gliksten and Fryer. But still the plaintive plea "Keep football here" went unheeded. And so, on Sept 21st, 1985, The Valley's 66-year career as the home of Charlton Athletic came, apparently, to an end. The ground had seen many great occasions, and certainly far better matches, but it had never known a more poisonous atmosphere. 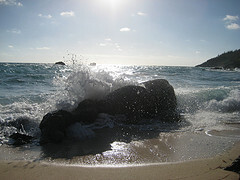 Anger, sadness and above all bewilderment hung obstinately in the air. A pre-match ceremony introducing some of the club's most famous sons coincided with the first of many pitch invasions, this one culminating in the laying of wreaths on the centre circle. The football itself proved so marginal to proceedings that its doubtful many people would have noticed if the teams had stayed in the dressing room. Later it would be said by some the protests were muted, but it would be more accurate to say that they were not organised. In this respect the supporters club failed its members lamentably, because as a body the fans might quite easily of prevented the match from taking place. They could of watched in stony silence. They could even of sat down in the roads around the ground and refused to enter. However, no one seemed prepared to take the lead, so instead it was only a shambles of discontent. But protests there were. Before kick-off, a group of a hundred or so fans invaded the East Terrace, and sat down in the middle of it until they were gently but firmly shepherded by police. Throughout the match, a large section of the 8,858 crowd persisted in explaining to Fryer precisely where he could stick his Selhurst Park. The next pitch invasion came during half-time, delaying the resumption of play by nearly ten minutes. Wave after wave of young men clambered over the low railing in front of the terrace that divided the main stand with the Covered End, appealing by gesture for the fans behind the goal to join them. The sheer weight of their numbers overwhelmed the efforts of the police to restrain them. The more conservative patrons of the seats declined to join them, perhaps because they were prevented from doing so by the formidible fence. Instead they showed their support by applauding, and chanting "We're proud of you, Charlton". When the pitch had finally been cleared the game resumed, but still the crowd chanted its slogans. "We hate Palace" echoed around the old ground, a reminder that the directors had further compounded the folly of leaving by choosing the wrong alternative venue. When the final whistle went, the players and officials fled as if for their lives, and now the fans, young and old, poured onto the pitch and the protest began in earnest. But it was much, much too late. The directors had left their places and the chants of the angry crowd were directed only at empty seats. My mind, like the crowd, was a confusion of emotions. Most of all, however, i was simply frustrated that the directors could not, or would not, see what was blatently obvious to everyone else. Namely that what they were proposing to do simply could not work. It would not fail just because of the chaotic South London traffic system, it would fail because Charlton Athletic and The Valley were one and the same thing. It was playing in Floyd Road, SE7, that gave the club its identity and the team its legitimacy in the eyes of the supporters. Take that away and eventually you would have nothing but a gang of mercenaries in red shirts"
The atmosphere being described as poisonous and a shambles of discontent are exactly what my memories are of the day. 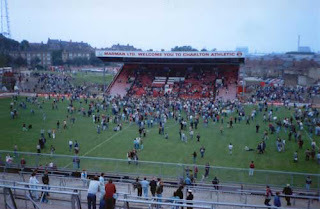 Many would argue that this was the day that Charlton fans united, in fact going through the pain of leaving The Valley would be the springboard to a new and brighter chapter in the club's history. As I said, I was there that day and was on the pitch after the game, finally getting on from the closed East Terrace once the old bill gave up the chase. I remember only leaving after a man who had climbed the floodlight pylon, was finally coaxed down. I took some turf home dug from the pitch and planted it in my Mum's garden. It died. My brother and I used to drive to the vacated Valley on Sundays and break in, well it wasn't really breaking in, it was climbing in and we would wander around and read the grafitti that others had left. We used to have conversations regularly about which team we would support when Charlton died. I got an email from a Chelsea fan today bemoaning the loss of Jose Mourinho and going into one about the blackest day in their history and that Avram Grant is the new Les Reed. I told him he should support a real club. I do.